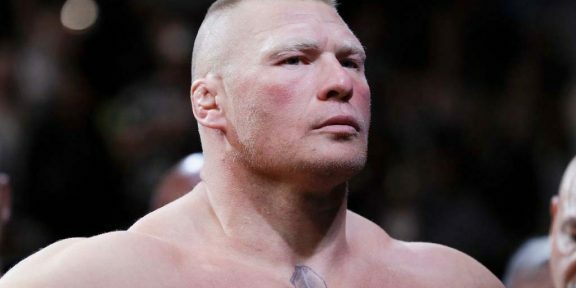 Contacted by the Associated Press to give his side of the story regarding the failed drug test, former WWE and UFC Heavyweight champion Brock Lesnar said that they will get to the bottom of this as he tries to clear his name. In the run-up to UFC 200, Brock always denied using any sort of performance enhancing drugs and always passed the drug tests. Well, except this one. USADA’s flagging of his June 28 drug test means that if confirmed, he will likely be suspended for the next two years, the minimum for a first offense. If he tests positive for a substance which is also banned by the WWE Wellness Program it’s also likely he will be suspended by WWE for 30 days. Brock will have a full, legal review process before any bans are imposed on him by the UFC and the Nevada State Athletic Commission. More samples will probably be tested before a final decision is taken. The USADA, UFC and Lesnar himself all declined to specify the substance which he was popped for. USADA and the UFC do not release the substance as long as the fighter himself doesn’t speak about it. The Nevada State Athletic Commission however is different and will release the substance if the result of his UFC 200 fight has to be overturned.